Pasture, Rangeland, and forages cover approximately 55 percent of all U.S. land. Forage grows differently in different areas, so it’s important for farmers and ranchers to know which types and techniques work best for their region. The following insurance programs for pasture, rangeland, and forage (PRF) utilize various indexing systems to determine conditions. Vegetation Index (VI) – is based on the U.S. Geological Survey’s Earth Resources Observation and Science (EROS) normalized difference vegetation index (NDVI) data derived from satellites observing long-term changes in greenness of vegetation of the earth since 1989. 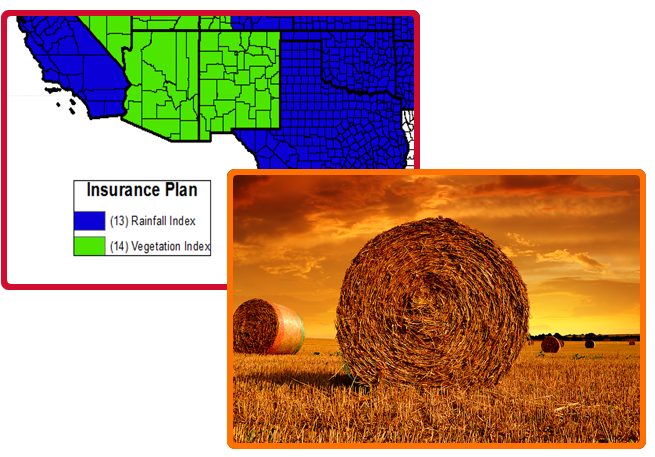 Forage Production Index – is based on NASS county level hay yield data (all hay or alfalfa hay). The index reflects how much hay is produced relative to the long-term trend for the county. Coverage is available for forage production in select counties.